Ken Atchity joins us once more to discuss his new novel, The Messiah Matrix, how it was published, and prospects for this and other novels with Hollywood potential. More than modern thriller (which it definitely is), The Messiah Matrix is a thought-provoking, original examination of the origins and evolution of modern Christianity. 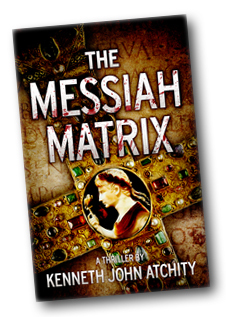 The Messiah Matrix is a contemporary thriller that takes the reader on an exhilarating quest from the ancient city of Caesarea to Rome’s catacombs and beyond, and provides gripping confirmation for all those who have ever wondered about the actual historical existence of the “Christian Savior”. The Messiah Matrix website is here: http://www.messiahmatrix.com. This entry was posted in Podcast and tagged Atchity, Messiah Matrix, thriller by Larry. Bookmark the permalink.